You gather your clothes out of the dryer, set them in a pile to sort, lift up some gym shorts to fold and catch a whiff of that musky set in smell. Do you throw them out? Dunk them in bleach? Stop going to the gym? Fortunately, OdorKlenz can keep you from taking drastic measures. We know how frustrating it is to have done your best to provide cleanliness for your family and still catch a whiff of unpleasant odors. Clean is not supposed to smell bad! Even in dry climates, mold and mildew find places to take hold. The smallest amount of moisture can lead to the pervasive and frustrating challenge of needing to remove that distinct scent from your clothes or linens. Washer and dryers are notorious for transferring unpleasant smells to your clothes, and even after cleaning your machines, your fabrics will need extra special care to return to their odor-free glory. Use the popular OdorKlenz Laundry Additive to do just that! Our additive, made from safe earth minerals, is gentle enough for delicates, but powerful enough to deodorize the heaviest garments and linens. Simply include it alongside your regular wash routine and worry no more about embarrassing smells from mildew damage. 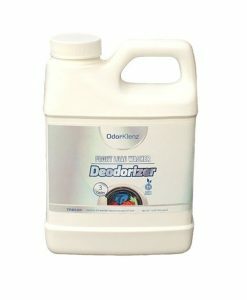 Never throw out a musty towel again – restore it with OdorKlenz for a clean you can’t smell! Most of the scented products we use on a daily basis – from cleaners to perfumes – use powerful fragrances which tend to linger. A hug from Grandma can leave you with more than a warm and fuzzy feeling – and you don’t necessarily share her taste in perfume. A few hours of cleaning can leave your clothes smelling of fake pine and bleach – not ideal for relaxing at the end of the day. Though they are a common part of our lives, these scents can be a source of major annoyance and for those with chemical sensitivities, can trigger harmful reactions like headaches and nausea. If you find that your detergent is leaving a strong fragrance on your clothes and linens, it is a sign that they are holding onto those harmful particles as well. Adjusting the amount of detergent you use or switching to one with less fragrance will help, but you will still need to neutralize the build up on your fabrics. No stress! 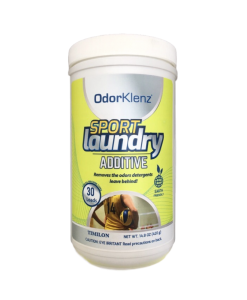 OdorKlenz laundry additive comes in liquid or powder to complement your normal wash routine and will take care of those chemical smells in one wash! Our Customers are excited about our new Sports Laundry Additive – almost as excited as you are on game day as you cheer for your favorite athlete! At OdorKlenz we wanted to design a product that would address the particular scents left in gym bags and on uniforms all around the country because they are some of the most difficult to remove. Athletes play hard, so we worked hard to find them a safe and effective way to get their fabrics clean and ready for game day. We all know that moisture breeds bacteria. Because sweat is an organic substance, that bacteria can thrive and reproduce, creating foul odors which our clothing’s fibers lock-in. When this happens, a regular wash is often inadequate for removing it. Additionally, because laundry is usually piled up and remains damp while it waits to be cleaned, these odors can transfer to other fabrics in your home. So your favorite blouse now smells like Timmy’s PE locker! The proprietary technology behind our products is designed to hit odors hard with pure, naturally derived ingredients. They are safe to use on all types of fabrics (including moisture wicking material), but tough enough to claim total victory over the stench. And we do this without relying on masking agents, so you don’t have to worry about the odor reappearing the moment your athlete breaks a sweat. In a match against OdorKlenz, these odors don’t stand a chance! The dreaded musty towel odor can be one of the toughest smells to remove from your laundry. Towels are one the most important items in your linen closet that need to be kept clean and odor-free. Damp towels can be a breeding ground for bacterial growth, which is what actually causes that“musty” or “wet” smell. Normal detergents are designed to just mask the odors with fragrances and perfume scents rather than neutralize the odors at the source. 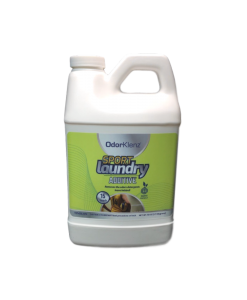 OdorKlenz Laundry additive can help remove wet towel smell, with its mineral technology, providing you with the odor free results that you deserve. Sometimes the very machine we rely on to keep our fabrics clean and fresh succumb to disgusting odors themselves. A light whiff of mildew can quickly grow into a severe odor problem and if not dealt with swiftly, can lead to a more critical issue of mold. Most consumers try to leave the door to our washer open to let it air out, but it is simply not enough to prevent the moisture from gathering bacteria and creating terrible scents deep within your machine. Every washing machine manufacturer has instructions on how to remove debris build up which causes the most offensive aromas, but those smells tend to persist even after a thorough scrub and threaten to leave all of our fabrics smelling like a dingy washer! The OdorKlenz Washing Machine Deodorizer reaches the places you simply can’t with elbow grease. Use it for odor removal if you find your machine smelling funky and then follow up with a monthly cycle to keep it odor free. Our gentle, but powerful formula is made from natural, non-abrasive minerals which will not scratch or damage your machine. 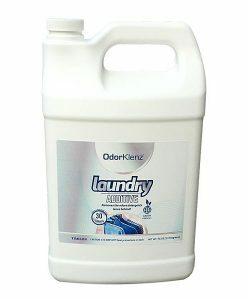 Suitable for front loaders and top loaders alike, OdorKlenz never relies on masking agents so your washing machine will have the smell any clean washer should: none at all! 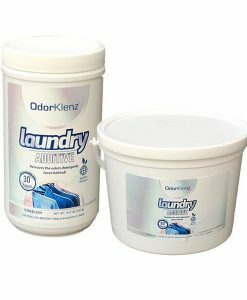 Whatever your laundry odor needs, OdorKlenz is eager to assist you in keeping your clothes and linens fresh. We are confident you will love these additions to your cleaning routine. Our products work with your standard detergents to ensure that your laundry is truly clean – because clean has no odor!